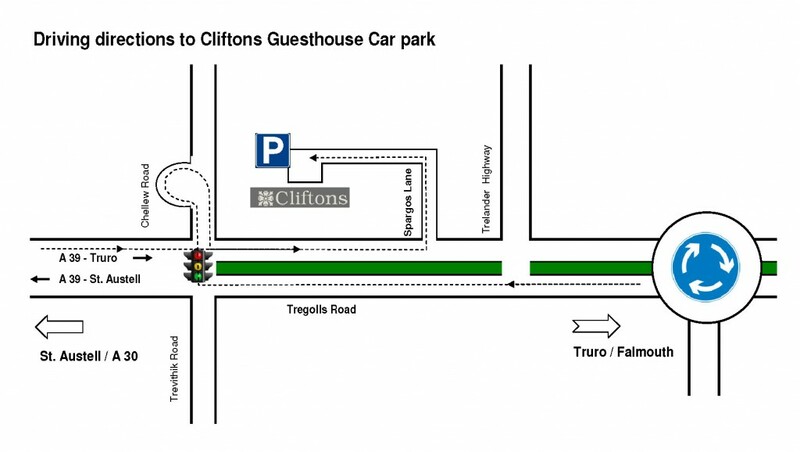 Cliftons is best approached via the A390 from the St. Austell direction. On entering Truro, you meet a set of traffic lights from which the road continues in the form of a dual carriageway. Remain in the nearside lane. After a short distance, you will see the Cliftons sign on your left. Continue for a short distance and you will see Spargos Lane on the left. Turn into Spargos Lane and follow it around to the left, Cliftons car park can clearly be seen towards the end of the lane. If you need further assistance, please call, email or complete the contact form.